The waters that surround Seychelles are home to over 1,000 species of fish and 300 species of coral. The islands are visited by giant Whale Sharks and Manta Rays, and are home to the critically endangered Hawksbill and Green Turtles. Its warm tropical waters and coral reefs teeming with fish mean that Seychelles is a popular diving destination. 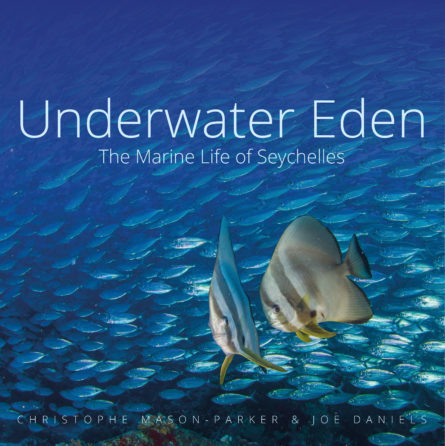 This lavishly illustrated book showcases the extraordinary marine environment of Seychelles’ islands. The diverse marine habitats, including coral reefs, granite seascapes, mangroves and seagrass beds, are home to vibrant communities of marine fauna and flora. Underwater Eden encapsulates the wonder of Seychelles’ seas and highlights the creatures that call them home. With the effects of climate change becoming increasingly apparent throughout the world’s oceans, the authors’ stunning photographs capture the beauty of Seychelles waters while they are still vibrant and relatively undisturbed. Chapters on ecosystems, turtles, fishes, Marine Protected Areas and conservation describe and illustrate the marvels of this underwater world. –	Christophe Mason-Parker is a conservationist and a photographer who has long had a fascination for the marine world. Having worked on numerous conservation programmes from Southeast Asia to the Caribbean, he is now living in the Seychelles where he runs the NGO Global Vision International Seychelles. He is co-author of Underwater Guide to Seychelles. –	Joe Daniels is an award-winning underwater photographer and keen conservationist. He has worked in many outstanding locations throughout the world, however it is his long-standing fascination with Seychelles, which has seen him continually return to the archipelago to work on marine conservation and research projects.